I sometimes crave for those real, juicy burgers that offer something more than the usual popular fastfood chain grub. It was one of those days when I spotted this interesting offer at Metrodeal. The Burger Lab seems like an interesting place I could try with my friends. I like the idea when I saw the tagline “Build your own burger” and with 40% off, I was willing to experience what they have to offer. reviews to play it safe a bit. I found a couple from other sites and they recommend the place. 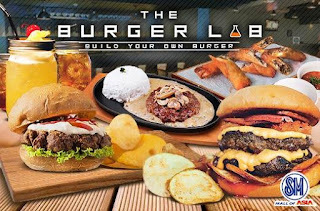 With that, I purchased 3 vouchers at PhP299, each good for P500 worth of food & drinks at The Burger Lab at Prism Plaza in MOA Complex. Tagging my best friends along, we redeemed our vouchers last Saturday. Like a kid on Christmas morning, I was quite delighted with the laboratory feel of the place and the idea of “building” my own burger. I loved how the sauce & stuff are served in syrines with your preferred ingredients. Missy, one of my BFFs didn't opt for the creative choice and ordered The Cardiac Burger that almost made me regret the novel idea of customizing my burger. It's definitely not for the fainthearted and I can almost see the oldies making the sign of the cross with how decadent it looked. Jennie's the ultimate pasta lover so ordered the Burger Spaghetti, of course, along with Burger Lab Nachos. I have to say it was a fabulous experience and we already agreed to come back real soon.